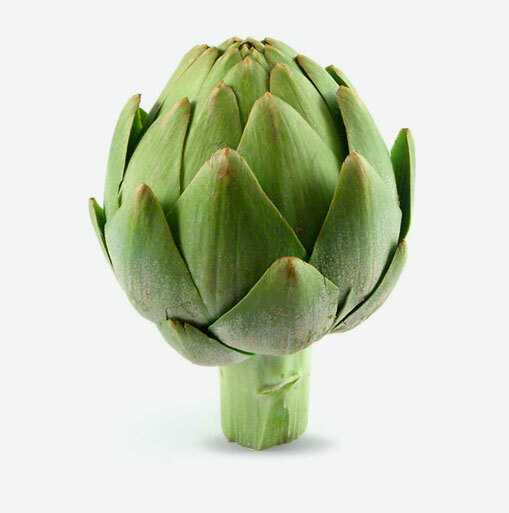 The ancient Romans considered artichokes an aphrodisiac, a diuretic, a breath freshener and even a deodorant. Tonics of artichoke leaves have been used as blood cleansers, liver and skin detoxifiers. Today, studies about phytochemicals contained in vegetables and fruits are confirming some of these ancient claims. Current research is showing benefits to the liver from cynarin, a compound found in the artichoke’s leaves. Silymarin is another compound found in artichokes that has powerful anitoxidant properties and may help the liver regenerate healthy tissue. Artichokes provide important minerals such as magnesium which is beneficial for the heart, iron and calcium. Artichokes are a good source of fiber, folate and are cholesterol free. Making artichokes a part of your low-fat, high-fiber diet, can help reduce the risk of certain types of heart disease, cancers and birth defects. Choose artichokes or “globes” that are dark green, heavy, and have tight leaves. Don’t select globes that are dry looking or shriveled. If the leaves appear too open then the choke is past its prime. You can still eat them, but the leaves may be tough. (Don’t throw these away you can always make artichoke soup). Store artichokes in a plastic bag in the refrigerator away from apples and onions. They will keep up to three days. Rinse artichokes one by one under running water. Do not cut away the entire stem. Leave about 1 1/2″ or so, trim the end and peel the top layer off the stem. Remove the really small leaves along the bottom of the choke. Some people whack off the top inch or so of the choke to remove the thistles and to even out the top prior to stuffing the choke. You may also use scissors or a sharp knife to trim away the sharp tips. Prepared artichokes should be placed in a bowl of water with the juice of one or two lemons added until you are ready to cook them. Artichoke eating is a hands-on affair. Pull each leaf off the choke and hold the pointed end between your fingers and drag the leaf between your teeth. Most of the edible portion is on inside bottom third of the choke leaf. Artichokes are commonly served with a dip such as lemon-butter, or mayonnaise. Once you’ve eaten all the leaves and you see a bed of fuzzy or hair like strands, you’ve hit the heart. Scoop out the fuzz with a spoon and discard. The rest of the base of the choke is edible and this is the favourite part of the artichoke for some people.